UPDATE: There is a snowman movie coming out! They are looking for film and photos of snowman if you have any available! Please contact Pam directly and not me. Thanks! Docutainment Films is seeking content for the upcoming documentary on Snowman & Harry de Leyer. If you have film/photos/articles about any of the topics below, please contact Pam Aguilar at email pam@docutainmentfilms.com. I am so pleased and excited to see all of these posts about Snowman and Harry de Leyer. I would LOVE to hear from anyone who has personal memories of Snowman, including anyone who remembers watching him compete. Please contact Elizabeth if you can share any information about Snowman or Harry!! The abundant life is within our reach if only we will drink deeply of living water, fill our hearts with love, and create of our lives a masterpiece. Harry de Leyer was late to the auction on that snowy day in 1956, and all of the good horses had already been sold. The few that remained were old and spent and had been bought by a company that would salvage them. Harry, the riding master at a girls’ school in New York, was about to leave when one of these horses—an uncared-for, gray gelding with ugly-looking wounds on its legs—caught his eye. The animal still bore the marks that had been made by a heavy work harness, evidence to the hard life he had led. But something about him captured Harry’s attention, so he offered $80 for him. Harry took good care of the horse, which turned out to be a gentle and reliable friend—a horse the girls liked to ride because he was steady and didn’t startle like some of the others. In fact, Snowman made such rapid improvement that a neighbor purchased him for twice what Harry had originally paid. But Snowman kept disappearing from the neighbor’s pasture—sometimes ending up in adjoining potato fields, other times back at Harry’s. It appeared that the horse must have jumped over the fences between the properties, but that seemed impossible—Harry had never seen Snowman jump over anything much higher than a fallen log. But eventually, the neighbor’s patience came to an end, and he insisted Harry take back the horse. For years, Harry’s great dream had been to produce a champion jumping horse. He’d had moderate success in the past, but in order to compete at the highest levels, he knew he would have to buy a pedigreed horse that had been specifically bred to jump. And that kind of pedigree would cost far more than he could afford. Snowman was already getting old—he was eight when Harry had purchased him—and he had been badly treated. But, apparently, Snowman wanted to jump, so Harry decided to see what the horse could do. What Harry saw made him think that maybe his horse had a chance to compete. Audiences cheered every time Snowman won an event. He became a symbol of how extraordinary an ordinary horse could be. He appeared on television. Stories and books were written about him. As Snowman continued to win, one buyer offered $100,000 for the old plow horse, but Harry would not sell. 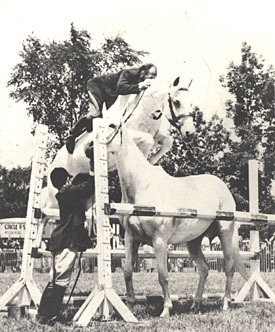 In 1958 and 1959, Snowman was named “Horse of the Year.” Eventually, the gray gelding—who had once been marked for sale to a low bidder—was inducted into the show jumping Hall of Fame. For many, Snowman was much more than a horse. He became an example of the hidden, untapped potential that lies within each of us. This entry was posted in personal on May 1, 2013 by admin. I only recently heard of this story and was absolutely inspired by it. I did a little research and learned that two books were written about Snowman, both out of print. Could you or anyone help me about how to find one of those books? I am hungering to read it. You might try contacting them. You might try ebay. They sometimes will have “Snowman” listed. That is where I obtained my copy. Is this a true story about an actual horse, “Snowman”? I am assuming so. I’ve ridden with Harry deLeyer for 20 years. When we met I was about to give up riding for fear of getting hurt. He gave me one lesson on one of his stallions, Dutch Fire, the full brother to Dutch Crown, the horse who had won so many jumping championships for Harry. I jumped higher than I had ever done before on a horse that day. The horse was magnificent and Harry believed in me. Since that day 20 years ago, I have competed in World Cup qualifyer classes in Holland and given lessons to many folks who didn’t believe in themselves. Harry taught me a lot about horses; how they think, how to ride each as an individual, not more than anything else, how to believe in yourself, your instincts, and your horse. I have sucessfully trained many of my own horses and those of others who were thought to be throw aways, just like Snowman. The photo above seems unbelievable, but I can attest to Harry’s unbridled trust in his horses, and their trust in him. I will be forever grateful for the opportunity to know Harry deLeyer and learn from his faith; his faith in God, faith in humanity, and relentless faith in himself. I think of him each and every time I face a new situation and fear the unknown. Trust yourself. Try. Give. Succeed. I am wondering if Amanda would know how one could contact Harry deLeyer for an interview. I am working on a reseach project and this story and Harry deLeyer would be perfect for an interview. I can get information on the website about the history but a personal interview even if by phone my a research project immensly. I have the information for you from Amanda Carolyn, but can’t get past your spam blocker. Hopefully Amanda will….. if not, please add doona at woodka dot com to your mail list and send me an email – thanks! When I knew Harry and Snowman they were on the top of the world..special barn, special baths and so much more..Harry was surely a stern task master, wanting the best from those who rode with him and the best from the horses as well..at times .. we riders feared Harry but I can’t remember a time when I didn’t walk out of those barns or the arena grinning ear to ear, soaked in sweat and completely exhilerated. Learning to have that “special” relationship with horses got me through some pretty rough times as an adult..for that I thank Harry DeLeyer/Hollandia Farms and think about him and those times often.. I have known the DeLeyer family all my life, Andre DeLeyer is who gave me my love of jumping. Harry and his beautiful horses like Snowman and Dutch Jewel, and Andre with the breath taking Dutch Bend who stoll my heart the first time i saw him stick his midnight black head out his stall. Andre’s wife Chris will always have a special place in my heart to, because she helpped me over a serious fear from a bad fall. The DeLeyers have not saved just one horse but in the years i’ve known them they have housed many like sweetie who was blind on one side, and head cases who i wont mention, but still got the same love. They are wonderful people and i with them all the best. The DeLeyer family in my opinion is what many equestrian stables should strive to be more like. The horse glory business is controlled by the same handful of people. They nominate and glorify eachother. As a young girl with friends at Hollandia, I remember walking past Snowmans stall, always pausing in awe at their story. Mr. Deleyer and I spoke many times through the years at the Junior Olympics and at Old Field. I rode many of the horses in later years from Hollandia, at intercollegiate horse shows and rode at their farm in St. James. Long Island was a special place for many of us horsepeople. I rode with Harry for several years, greatest horse man i have ever met. Rode many of his horses and all of them are all heart and give. I have one of his many great studs foals. I read the story of Snowman in a Readers Digest Annual my father bought me one Christmas back in about 1960 when I was six years old. I never forgot the story of Snowman, a true champion with a big heart. I’m nearly fifty four, yet even now, I remember – and wish I could find a copy of the story. Apparently these are hard to get now and expensive…. I was raised in Amherst County, (Virginia) Homewood Farms. My Father’s boss David Hugh Dillard hired a horse trainer from Holland, his name was Harry de Leyer. He was dutch, had a lovely wife and many children. He taught me how to ride and I grew up owning 43 acres and many horses. I always wondered what happened to this wonderful man. I am trying to find out if this story is about the same man I knew as a child. Please, if there is anyone out there that know how I may get in touch with him or his family, I would be most delighted. Thanks so much! What a wonderful story! PS: They walked in wooden shoes and he gave me a pair and I still wear them. I was wondering if a book had ever been written about ‘Snowman’ ? If so I would love to purchase. A few years back I read the amazing story about Seabiscuit. Snowman reminds me of that story…amazing !!! When I was a young girl I went to my Aunts bungalow in New Jersey and saw Snowman at a horse jumping competition and was in awe!! I read the book and so did my oldest daughter, who had a horse of her own growing up. I would dearly love to own a copy about this wonderful animal. He was beautiful and inspiring ! I still remember that day some 47 years ago. i was too young to see snowman compete but i was lucky indeed to be his groom at his retirement ceremony at “the garden” in 1969.he was without doubt,the real deal. I was too young to see Snowman compete but i was lucky indeed to be his groom at his retirement ceremony at “the garden” in 1969.He was, without doubt, the real deal. There are two Snowman books for sale on Ebay, ending 04/05/08. I rode with Harry DeLeyer in 1965. I saw Snowman in the Children’s classes — as he was gentle and sweet to the beginners. My beloved Horse Sparkle is buried at Hollandier Farms….and my biggest heartbreak was the way Harry’s son’s talked about my wonderful steed. Sparkle was a beautiful blood red chestnut — but he had a Roman nose. He had 4 white socks and most likely was of Morgan background. He was NOT a show jumper – but he was my friend, companion and steady as a rock. He was gentle and loving – Harry’s son’s made fun of him. Sorry – he was not snowman…. what does this mean- my comment is awaiting moderation. ?? Sorry, Charlotte – I moderate all first-time commenters. Once you have an approved comment, you can post anytime! I also saw Snowman with his carpeted stall at Hollandia Farms and rode with Harry DeLeyer. I still have my Snowman book after all these years. me and my family has known the deleyers for 40 years or better,and i reconize most names on this blog, knowing most of them. yes harry was one of a kind ! no doubt. he still resides in virgina to day. long island was something back then. but trust me they would not treat horses today ! like the family did then! I was a student at the Knox School 1967-1971 Mr. DeLeyer was our riding instructor. I had the honor to ride Snowman many times. He was a great horse and there was a respect for his master – and the master respected Snowman. Mr. DeLeyer loved that animal. I have my copy of Snowman and will treasure it always. I’m proud to have been acquainted with the DeLeyer family and their legacy. I was a student at the Knox School 1967-1971. Mr. DeLeyer was our riding instructor. I had the honor of riding Snowman many times. He was a great horse and there was a respect for his master – and the master respected Snowman. Mr. DeLeyer loved that animal. I have a copy of Snowman and will treasure it always. I’m proud to have been acquainted with the DeLeyer family and their legacy. I think I have a stallion with Harry Deleyer horses bloodline. Can any one tell me what breeding/bloodline/stallions are Deleyer’s horses. I am in the UK – the stallion I have is Dutch Royal. Does any one know how I can get Hold of Harry. I grew up on Long Island and hunted when Harry was Master of the Hounds and Dr. Arthur Fredericks was Master of the Hunt. Hunting with the Smithtown Hunt with Harry was an experience I would never trade. Yes he had his reputation, but that man sure could ride. I will always remember Hollandia Farms. I understand the property is still there, and perhaps another horseman will be investing in rebuilding and raising horses on it ? I’m old enough to remember Harry competing with Snowman. There were times the pair of them just about took the roof off Madison Square Garden during the National Horse Show. I was a city kid with a great love of horses, and the National was an annual treat. Snowman loved to jump and he was breathtaking to watch. Some horses you “ride” to victory; others find victory on their own – you just have to hold still and go along for the ride. With Snowman, Harry became one with his horse and went along for a glorious ride. But for all his competitive spirit, Snowman was the gentlest creature on earth, completely reliable with the youngest riders. The last time I saw Snowman he was in his stall at Hollandia Farms. He was about 30 years old at the time, pampered and contented. I don’t know how much longer he lived, but he’ll always live in my heart. hi my name is frank ive had the pleasure of working for the man who sold harry that horse his name was milton potter . from what i understand harry bought snowman from one of the killer pens . it was an old story but they talked about it like it was yesterday . i never new harry but met his sons they use to come over to midisland arena when there was a jumping show . horsemen like harry and milton are hard to find theese days . Back in the sixties I used to ride a horse for some folks that boarded their horse at Hollandia Farm. I was like the kid from the wrong side of the tracks and did not fit the profile of that days equestrian at all. Harry sort of took me under his wing in his own hands off kind of way but he was a good man to me and an incredible horseman. I spent several years working around the stable and became good friends with the family. His oldest so Sjef and I caused a considerable amount of mischief back in those days and I will always look back on those days as some of the most memorable in my life. I remember when Harry had completed his new indoor arena. It was state of the art back then and for the grand opening Harry had some tack thrown on snowman who hadn’t been ridden let alone jumped for a long time. Across the entrance to the arena was stretched a huge red ribbon at least four feet high. Harry turned Snowman towards the ribbon and he flew over it with a foot or more to spare. What an incrediblly talented and sweet horse he was. I love reading all these posts about Hary DeLeyer and Snowman. I attended Knox School when Mr.D. first brought Snowman there. The biggest beginner girls used to ride Snowman at first, then he began to see how well and consistantly Snowman could jump. I showed him in a jumping class, and once jumped him 5’6″ – a great thrill! It was exciting to see him jump in the Garden, and to see Mr. D. throw the reins away after the last fence! Anyone remember that? That’s awesome, Bonnie! I’m always amazed how many comments this thread gets, years after I wrote it… thanks for visiting! This man is not, a saint the horse is, but not Harry. What is wrong with you people! i remember riding at hollandia farm, taking lessons from mr. deleyer i was so lucky and i didnt even know it. he was a tough instructor but as i look back he was fabulous. i learned so much from him. ahh the fun we had. over 40 years later im still riding and now breeding horses. thanks harry! Holandia Farm and the Knox School are both still there in St. James / Nissequogue, Long Island. I drove by both last week, and my little girls fed the horses carrots at the Knox School. Good things sometimes do endure. I STARTED WITH HARRY, FOX HUNTED AND SHOWED. MY FIRST SHOW HORSE WAS BOUGHT FROM HIM, DUTCH BIT/A BIT AFIRE. READING THIS BLOG BROUGHT BACK SO MENY MEMORIES. THANK YOU! this is sooo great! I read about him as a child! I had his book and was fasinated by him. I remember it was on Long Island where I grew up. I’m 55 now and was looking on Netflex for perhaps a movie about him! One certainly should have been made. What memories! As I am going back to college at my age, it makes me realize, that we all still have a lot to give to life and can go for the gold! Linda, good for you! I get so many comments on Snowman, and he inspired so many people. A great horse, indeed. And yes, we elders certainly do have a lot to give — am glad you are still learning and growing! Although my mother was a horsewoman I was content to just ride for my own pleasure. Competition or jumping were not part of my scenario. I know very little about Dressage, but found this story to be hauntingly beautiful. Thank you. Just wanted to say that I rode with Harry in the 90’s as a teen . I went to Blue Ridge Summer School in Virginia where he was the instructor for their riding program. I was 12 years old and I got to jump 4’6 oxers. It was awsome! and I was awe stuck by Harry, there was just something so special about him and his horses. He has like a Dutch twinkle or something. He and his wife Joan housed me for two summers after that. I have always remembered how they opened their home to me. I showed with Harry and bought one of my greatest horses, Dutch Oliver son of Dutch Crown. We had an amazing 4 years of show jumping together. I have never owned a braver horse. I have been out of horses for a while but Harry has always stuck with me and I will never forget him. Someone even came to get the story to do a movie back when I was staying with him …they were from Hollywood but then I never did hear anything else. I hope he is doing well and thanks for all these stories. That experience has been one of my best. I am getting back into riding after a 10 year. I just finished reading, The Eighty Dollar Champion: Snowman the Horse that Inspired a Nation, and I absolutely LOVED the story. I pray Walt Disney will make this book into a movie. We so desperately need a movie that inspires us, like Harry de Leyer and Snowman. Thank You, Elizabeth Letts for writing this Heart Warming story. Just finished reading The Eighty Dollar Champion: Snowman the Horse that Inspired a Nation and loved it! Thank you for having published it. I rode at Highland Stables in Delaware. Not long after reading the 1962 story of Snowman, the proprietor of our stable, with his daughter and I begging him to do so, rescued a gray mare about to be loaded on a rendering truck at the New Holland Auction. It was not the school horse he’d intended to buy, but for $125.00 this 14.2 pony was worth her weight in gold! She looked like Snowman and also loved to jump and we enjoyed traveling many horse shows together and once placed ahead of Devon Champion Prim ‘N Proper! An exciting time–love this blog and the stories! I just finished the book “THE EIGHT DOLLAR CHAMPION”. It was a joy to read and I highly recommend it to anyone who loves horses. I have 17 horses on my farm and each one is special. But it takes a special person to bring out the best gifts or talents hidden in an animal. It sounds as if Harry deLeyer was that type of person. I would have love to have met him. Does anyone remember a girl named Mindy Hurwitz and her horse Dutch Gent? He was 1/2 brother to Dutch Crown and he was absolutely gorgeous. She used to ride with Harry at Gold Coast Stables in Old Brookville. I will always remember what a gorgeous horse he was, jet black and just spectacular. Thank you Elizabeth for writing this beautiful story of Harry and Snowman. I took riding lessons from Harry back in the early 1970’s. It was such a wonderful experience! He was tough but he could be kind also. I saw Snowman in his later years where he had a place of prominence in the first barn. I brought him a carrot every week. 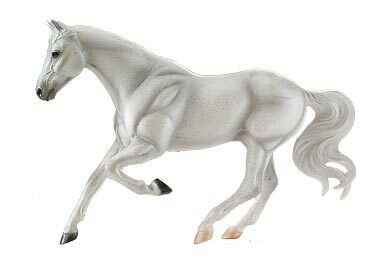 A few years ago, I saw the Breyers horse model on EBay and couldn’t believe it! What memories it brought back! Just thought of time that my car got stuck in the snow and Harry came over and just about lifted my car off the ground so I could get out! I have been reading all these wounderful stories that people have wrote about the farm.My older sister took lessons there and we went every Sat.I can remember going to visit Snowman and bring him carrots in his stall.He was such a big mush.We also would go down to the pond and try to catch frogs and in the winter we sat by the fireplace to keep warm and we would all go to my mom and get her change to get soda’s from the machine.I have such great childhood memories from there.Thanks for a walk back to my childhood!